Giants walked the earth. And they left behind in their wake a slew of legends. It’s easier to talk about their legacy than follow their paths. Their fantastical endeavours and achievements are out-of-reach for us, almost other-worldly – as if in recounting them, we hope that some of that unimaginable courage settles like magic dust on us. Their difficult and often hazardous journeys do however affirm the sheer joy of the possibility of living the impossible, of creating Adam. Giants walk the earth. They take these familiar tales wafted onto the living consciousness of the ground we walk on, the air we breathe, and make them their own. They stand on the shoulders of the giants that walked before them and hew new paths, forage their way through history and leave their imprints on earth’s most difficult terrains, even ski off them! And what drives these men on their paths, fraught with calculated risk, anxiety, potential, often mortal, dangers and the myriad unpredictable plays of Nature? Is it just obsessive ambition or a need to ‘conquer’ and stamp, intrinsic human behaviour? Or the gnawing need to live to your biggest potential? The need to explore and seek? Or the pursuing of your inner zen, the feeling of being present and having a clear purpose? Is it the road to spiritual enlightenment? Or is it purely because their threshold for risk is different? Or “because it’s there” as Mallory famously explained of his pursuit to scale Everest? There is no one definitive answer we receive, but we can catch glimpses of the answer, shimmering beneath the surface of this wonderfully crafted Sundance audience award-winning film Meru (2015). In 2011 a three-man team successfully made it to the 6310m (20702ft) summit of the central peak of Meru via the treacherous Shark’s Fin route. 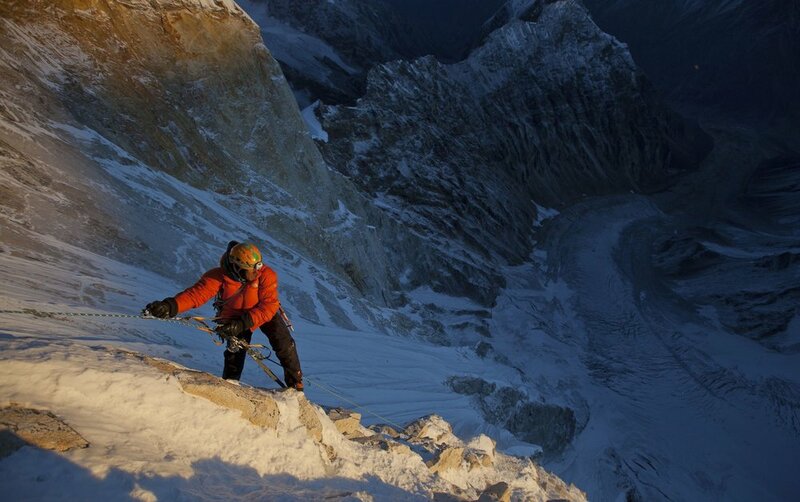 Conrad Anker, Jimmy Chin and Renan Ozturk had climbed their way to a world record. As they barely fit at the sharp lip of the summit, meeting the blue skies and clouds, they take in the profound moment – after 25 years and 25-plus attempts at one of the last remaining challenges of the Himalaya, the summit via the Shark’s Fin notorious granite overhang had been achieved. Finally. Meru peak lies in the Garhwal Himalaya in Uttarakhand, India where it feeds the headwaters of the Ganges. And Shark’s Fin has earned its name from the notorious 1500-ft steep vertical, nearly featureless overhang – it is considered one of the most technically difficult climbs in the world. The Shark’s Fin demands more than just A-grade alpine climbing skills. It is a challenge in high-altitude big wall mountaineering and hence requires master skills in ice climbing, rock climbing, big wall climbing, mixed climbing and of course, granite-strong resoluteness in the freezing cruel environs. One has to lug 200 pounds of gear up 6000m and then climb the overhanging wall, the most technical part of the climb. This means that one has to carry all the gear to the top. There are no porters to haul this gear or efficient Sherpas to mark your trail ahead of you and put the ropes up or the warm comfort of setting up camp. Meru has no place to set up a tent and one has to camp in a porta-ledge, suspended thousands of feet off the deck. Meru is called the ‘Anti-Everest’ by the film’s narrator Jon Krakauer for all the reasons it is starkly different to its ‘tourist-friendly’ cousin. Meru the docu-film was put together from the footage both Renan & Jimmy captured during both climbs – a crushing unsuccessful bid in 2008 where they had to turn back within 100m of the summit and the successful first summit of 2011. Both Ozturk and Chin are world-class climbers & adventure photographer-filmmakers; they are constantly on the go, chasing adventures around the world. Chin was Anker’s climbing partner on several expeditions and Renan was the boy-wonder climber and artist, with Meru’s technical climbing right down his alley. They were invited by Conrad Anker in 2008 to complete the team to make the Shark’s Fin bid, after his unsuccessful first bid in 2003. Conrad Anker celebrated alpinist and climber is the glue that cements this team with his years of intense experience, pragmatism and sheer will. He takes on the role of mentor to both the younger men. Conrad Anker is one of the best climbers in the world. His legacy includes ascents and expeditions in the Himalaya and Antarctica. It was Anker who found George Mallory’s body on Everest in 1999. Climbing the Shark’s Fin was a “culmination” of all that he had ever wanted to do. It was also his ode to his mentor, Mugs Stump, who had made two attempts to scale the Fin (in ’86 & ’88). Mugs had shown Conrad the ropes and would often pass him the reins, to take the lead whilst climbing. When Mugs died in a crevasse fall in Alaska in 1992, Conrad took on summiting Meru for his life’s mentor and friend. Meru offers the rare gift of being able to listen to the family members of these climbers, unlike most extreme sport chronicles that just focus on the high-adrenaline infused sport & the accomplishments. In Meru, we get to meet the significant people attached to our climbers. The female characters aren’t always thrilled and first-time accepting of the compulsive yet difficult choices these men make. But they stand firmly beside them; their anxiety gives way to making space for the zealous passion of the men in their lives. It is this insight into the internal conflict and churn of these climbers and the voices of their loved ones that propel Meru into another league of storytelling. 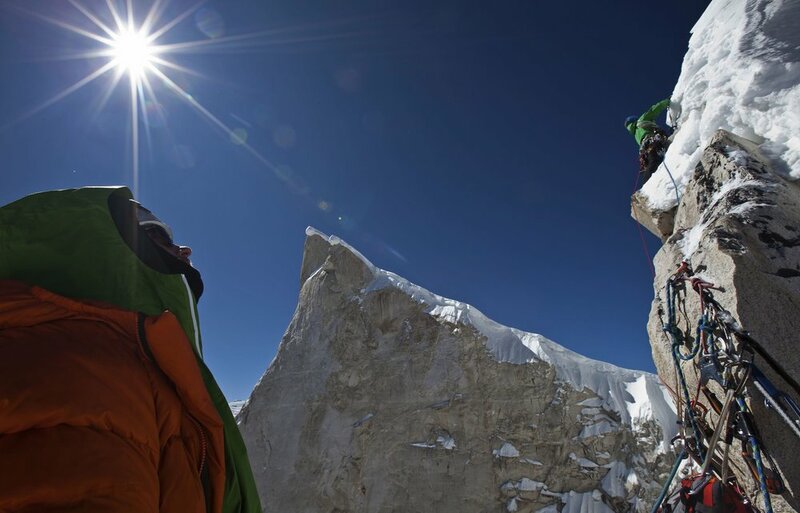 Jimmy Chin shares directing credit with wife, documentary filmmaker Elizabeth Chai Vasarhelyi. It is Elizabeth who has helped give shape and scope to the footage Jimmy had and the human emotion leverage on the storytelling. The interviews with the climbers and their families provide an inner journey into understanding the fine balance between going after one’s neck-risking passion and the restrained effort to stay within the calculated fringes of one’s safety margin and the bonds of brotherhood, loyalty and family. Author and climber Jon Krakauer (Into Thin Air, Into the Wild, Eiger Dreams) provides a compelling narrative to Meru as he shares context and insight to the happenings onscreen. And of course, the cinematography of the film is brilliant. Renan and Jimmy carried a Canon 5D mark II with two lenses, one zoom and a Panasonic TM900 for all their needs. One can only imagine how extraordinarily difficult it must have been to climb this technically difficult peak and also record the climb. It means anticipating certain shots and frames they’d want and getting there ahead and setting up to film. Not to forget the gear they were hauling up as well! Full credit to both these guys for providing us with an immersive visceral first-person perspective of their adventure.